Conestoga graduates Grigoriy Kozyrev, Andriy Strebkov and Ali Javed have launched Oko Social - an app now available through Google Play and the Apple App Store that lets users meet new people and make friends and connections by participating in events together. 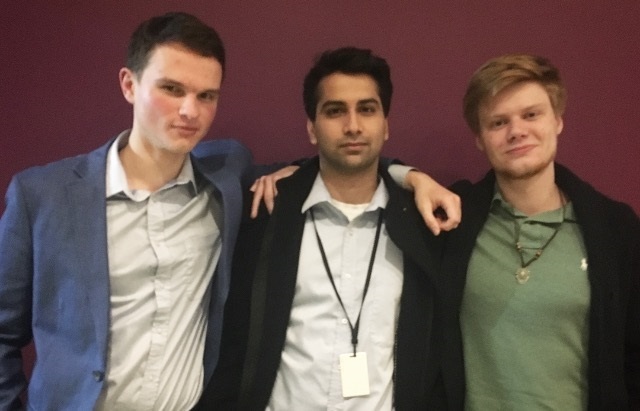 Conestoga graduates Andriy Strebkov, Ali Javed and Grigoriy Kozyrev have launched Oko Social - an app that helps people make new friends and connections by participating in events together. Kozyrev, a 2017 Software Engineering Technology (Co-op) graduate, and Strebkov, a 2017 Bachelor of Business Administration - International Business Management graduate, started exploring the venture in 2016. According to Strebkov, Oko is an Eastern European word that means circle - the app helps create a circle of friends for users by letting them organize events or find events to go to. The pair began working with Conestoga’s Centre for Entrepreneurship (C4E) in 2016 where they received mentorship and assistance to refine their business idea. They pitched their app idea earlier this year at the college’s annual pitch competition where they finished in first place, beating out seven other entrepreneurs to take home the $2,500 prize. They went on to submit their work for consideration to the William G. Davis Innovation Fund - launched in celebration of the 50th anniversary of Ontario's colleges - but say their biggest achievement was acceptance into the AC Jumpstart program. The program is delivered in partnership with Conestoga, Wilfrid Laurier University and the University of Waterloo at the Accelerator Centre and helps young technology companies by providing access to essential resources and experts. Businesses chosen for the program receive $30,000 in seed funding (to be matched by the recipients) and in-kind mentorship services from industry experts. Javed said the Oko team is working with testers to refine the app which is already receiving positive feedback from users, and noted the most significant challenge they face now is balancing their full-time jobs while they work on the start-up. Going forward the entrepreneurs hope the app will be useful to students at the college, especially international students, to help them engage in more activities on campus and adapt to Canadian society more easily. C4E supports the ongoing education of and exploration of entrepreneurship as an opportunity for students through a variety of programs, workshops and events at Conestoga. For more information, visit the C4E website.